Sætran Camping is located in rural and beautiful surroundings with the turnoff from Highway 62 Øksendal municipality located in Sunndal and is a good starting point for mountain walks, river and sea. The camp has been run since 1972. All cabins are equipped with simple kitchen utensils. Read more about the cottages here. Start Location: Roundabout in central Sunndalsøra. 1. 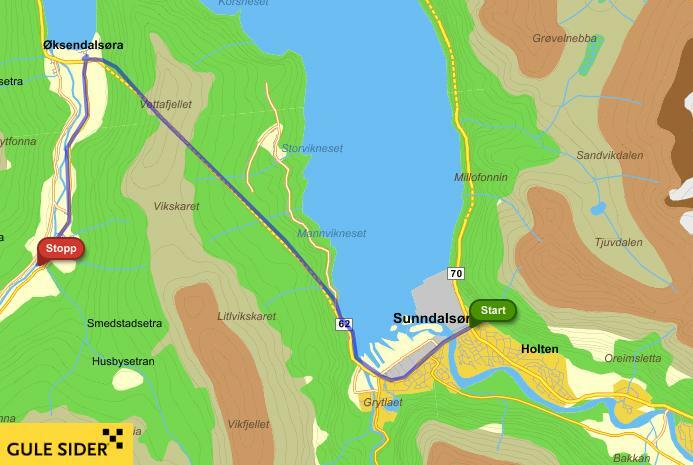 Start direction south-west on the Romsdalsvegen towards the Molde (Highway 62), drive 9.8 km. 2. Turn right onto øksendalsøra, drive 96 meters. 3. Hold right and proceed to øksendalsøra. Follow signs to the campsite from the abandoned grocery shop. Drive about 4.0 km. Designed and developed by Simon Ekren Gravvold.